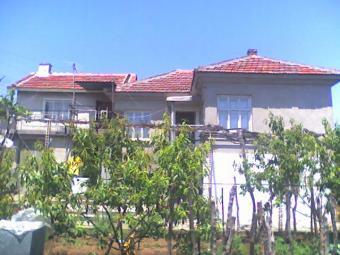 My 2 Bulgarian houses on the price for 1! Lesovo village. The climate is temperate continental with plenty of sunny days. Lesovo-on the banks of the Tundja River, offering opportunities for hunting, fishing and also camping.It offers also great recreation possibilities, one can rest, go fishing or simply bask in the sun by the river shore.There live 30 English familys. The climate is temperate continental with plenty of sunny days. The village has post office, medical center, a school,shops and pubs. There are two houses. The firsat house there are 2 floors.On the first floor there are 2 rooms, on the second there are 2 badrooms with a livingroom. In the other house there are two floors. On the first floor there are 2 room with bathroom, on the second livingroom and big balcony.There are also some farming buildings, an external sink and a well.The garden area is ideal for picnics & barbecues with friends, family gatherings or simply sunbathing! TOTAL AREA OF THE PROPERTY: 900 m2 There is also water and electricity at the Property. PLEASE SEND ME AN EMAIL AND I WILL SEND YOU MORE IMAGES AND THE PARTICULARS OF THIS PROPERTY!